The dishes seem to pile up quickly, and you need to wash them or rinse them off before you put them in the dishwasher. While you start to do this, you notice that the sink is filling up with water, and when you flip the switch for the garbage disposal, nothing happens! Now what? The smell is bad, the sink has bad water in it and all you wanted to do was get the dishes done. Don't worry! We have the solution with our Garbage Disposal Services in Phoenix, AZ at the press of a button. Simply give us a call and we can take of your garbage disposal repair, or even your garbage disposal replacement for you. We will make sure that what was supposed to go down the drain, stays down the drain. 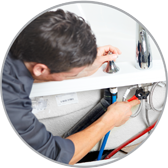 This is what professional plumbers do, we make sure that your garbage disposal repair is done quickly so you can get back to being in the kitchen without a foul smell coming from the sink. If you are looking to just replace your old garbage disposal, our professional team of plumbers can help you with the garbage disposal replacement too. All it takes is one phone call to get started and we can go over most of what you need right on the phone. Our customer friendly Garbage Disposal Services in Phoenix, AZ will show up quickly to take of your garbage disposal replacement faster than you thought was possible. And when they are all complete you will be more than satisfied with the level of work that they perform. So, stop holding your nose and pick up the phone today. Give us a call and let us tell you about our services and how quickly we can be at your house.